President Rodrigo Duterte on Monday urged the Filipinos and Chinese in the Philippines to cultivate values that will usher peace and understanding between them. SM Supermalls celebrate the Lunar New Year with various activities. 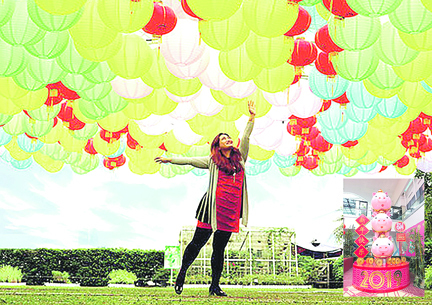 SM Aura Premier features a colorful display of Lanterns at the Skypark while the Mall of Asia (inset) focuses on family-oriented attractions and festivities such as lion and dragon dances and cultural performances. In his message to celebrate the Lunar New Year, Duterte said the “friendship and cooperation” between Manila and Beijing had allowed the Philippines to grow and harmonize two diverse cultures. “The friendship and cooperation forged between the Philippines and China have not only led to greater prosperity and economic growth for both our nations, but also [given] rise to a unique culture that is nurtured by harmony amid diversity,” Duterte said in a statement. Meanwhile, the Metro Manila Development Authority and the Manila City government will enforce this afternoon a Stop-and-Go traffic scheme in the Binondo area in connection with the celebration of Chinese New Year. No roads will be closed during the occasion but the Stop-and-Go scheme will be observed along the route of the New Year parade starting at 1 p.m. The procession will last up to three hours. “Together, let us cultivate the values and ideals that fuel our strong resolve to usher in a period of greater peace and understanding as we rise above the challenges ahead,” Duterte said. Before 2018 ended, Duterte deepened the Philippines’ “enduring relations” through a “positive engagement” with China as Chinese President Xi Jinping arrived in the country for a five-day state visit in November.